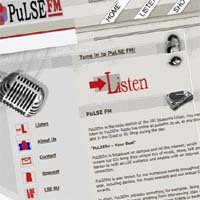 Radio news site PuLSEfm.co.uk has been awarded the best website prize at the Guardian's 2005 Student Media awards. PuLSEfm.co.uk is run by students at the London School of Economics and was praised by judges for picking up on the trend for podcasting. Recent interviews include Clare Short MP, Radio 1 DJ Nihal and US 2004 vice-presidential candidate John Edwards. By publishing in audio form the site avoids competing with the college newspaper and provides a point of contact for the PuLSEfm broadcast radio station. Students also find the audio format convenient. "Most of the students tend to have to read quite a lot for academic purposes, so listening to what is going on can be a good change," said station manager Stacy-Marie Ishmael. "One of the things that differentiated PuLSEfm from the competitors was that it did not have any commercial adverts that clashed with the colours of the site, which is something we intend to keep. "This might be a difficult task, as this year we have decided to open up to corporate partnership to help PuLSEfm grow." Around 1,500 students have used the site each month since the launch in October 2004. Pulsefm.co.uk beat competition from therundown.co.uk, soupmag.co.uk, wessexscene.co.uk and warwickboar.co.uk which was awarded the runner-up prize. Wessexscene.co.uk was the 2004 winner for its tabloid-style news site.